Located in the tropical garden of the resort, in close proximity to the pool, swim up bar and beach, you will love your Garden Villa Room! 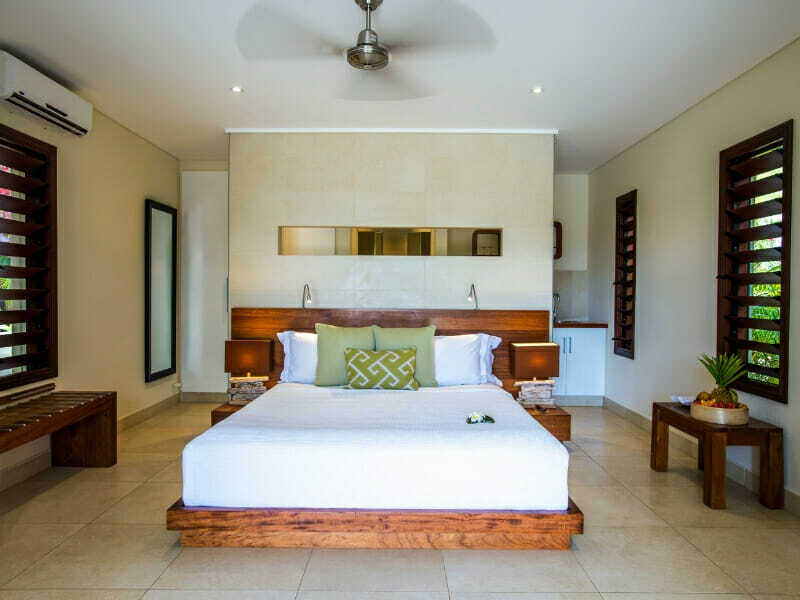 Furnished in tastefully modern style, these rooms include air-conditioning, king sized bed, private terrace with day bed, flat screen TV, DVD player and iPod dock. Avoid the stress of organising flights and luggage! 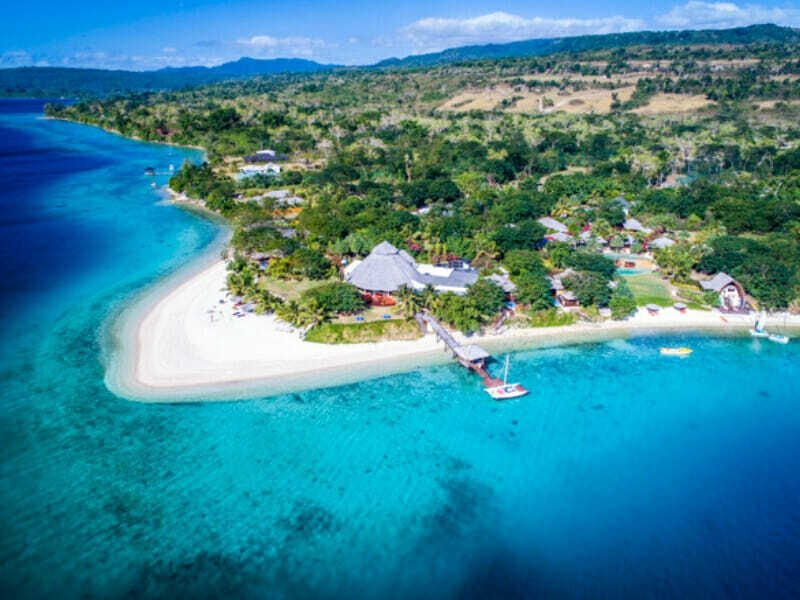 With return flights and 23kg checked luggage planned for you when you travel with My Vanuatu the only thing you will need to worry about is enjoying the experience. A holiday can be expensive enough without the added cost of food! 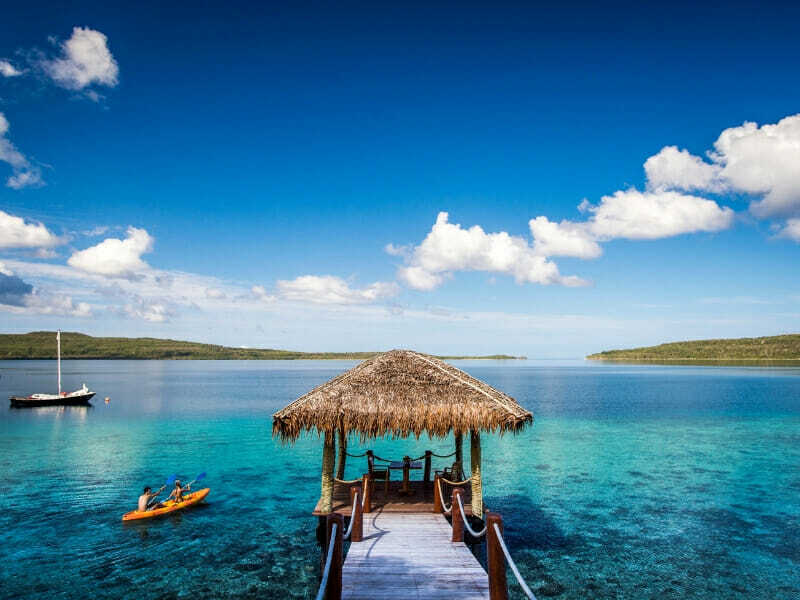 You can forget this worry when selecting this exclusive My Vanuatu package with 3 free meals per day, including a full English breakfast, 2-course lunch and a 3-course dinner daily! You will also receive complimentary afternoon tea service (3:30 – 4:30pm) daily in the resort main lounge, and complimentary bottle water in villa replenished daily. One special dinner on either the jetty or the beach! 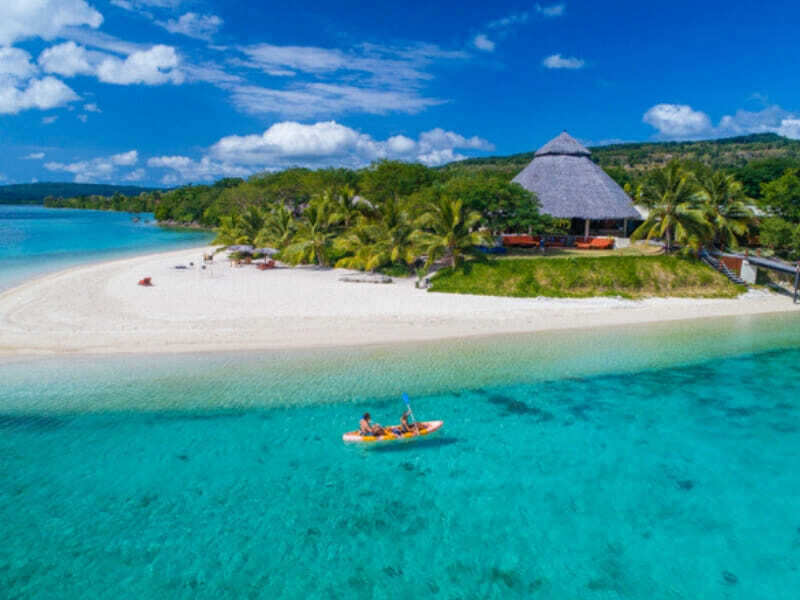 Not only are all meals included in this exclusive My Vanuatu package, but on two separate occasions you will receive one picnic lunch for 2 on a secluded beach, and one special dinner on either the jetty or the beach, for the ultimate romantic getaway! Relax and unwind at the Havannah Vanuatu with one 60-minute massage per person. This experience is a truly indulgent way to rejuvenate on your holiday. One drink just not enough to quench your thirst? No problem! In this exclusive package, you will not only receive a welcome drink upon arrival, but a bottle of champagne also! There’s no better way to start your Queensland holiday! Jump into the water and get active with complimentary use on non-motorised water sports equipment. 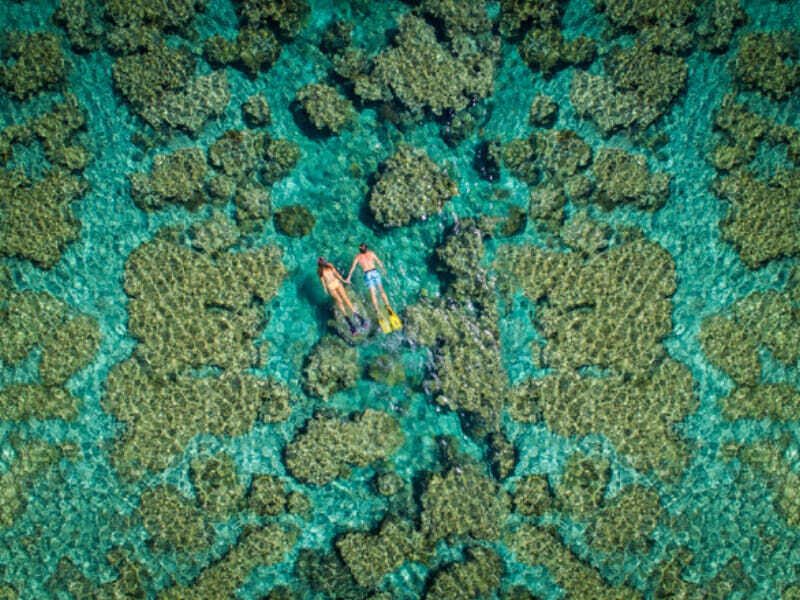 With snorkeling gear, kayaking and stand up paddle boarding, there is something for the whole family! This exclusive holiday package also includes free WiFi, an invitation to the weekly management cocktail party, a nightly sunset cruise each evening (subject to availability), daily Port Vila shuttle service and complimentary nightly turn-down service so you can have an incredible night’s sleep when you stay at The Havannah Vanuatu. Experience true Vanuatu hospitality with a welcome drink and fresh local flowers on arrival! This island-style greeting is the perfect start to your tropical holiday and will make guests feel at home at The Havannah Vanuatu! You will also receive a free gift from The Havannah Vanuatu, a Havannah Sarong & Havannah Beach Bag. The Garden Villas are located in the tropical gardens of the resort, in close proximity to the pool and beach. The Garden Villas are furnished in a tastefully modern style with air conditioning, king sized bed and private terrace with day bed. The rooms are additionally equipped with flat screen TV, DVD players, iPod dock, in room safe and quality bathroom amenities. An a la carte mini bar is available upon request. This room is 58m2 & sleeps up to 2 guests. 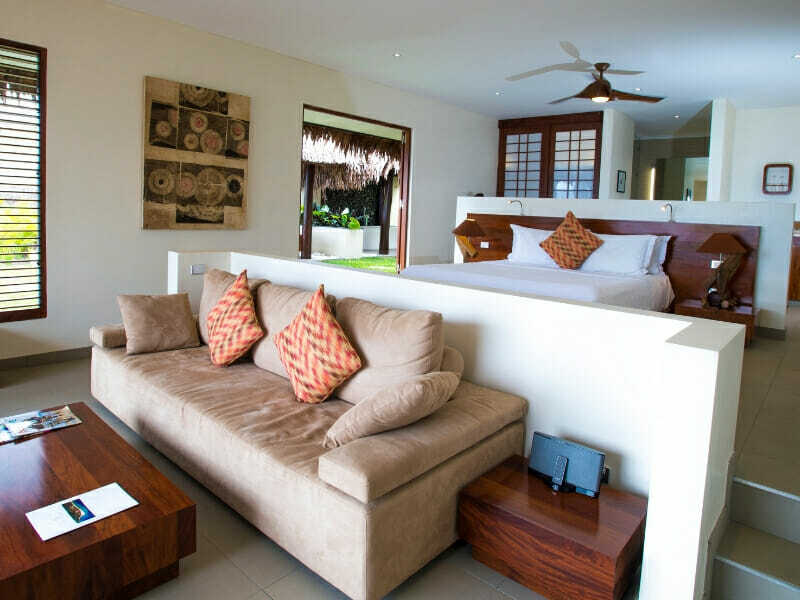 Lagoon Pool Villa – UPGRADE from only $300 per person! The Lagoon Pool Villas are set atop the magnificent split level infinity edge lagoon pool. Lagoon Pool Villas offer the best of both worlds with their own private beach and swimming pool entrance. All villas have either ocean or pool and garden views. The interiors are modern and luxurious offering tropical barefoot sophistication, and feature a daybed, sun lounges, king sized bed, and ensuite bathroom with his and hers vanity units. The rooms are air conditioned and equipped with flat screen TV, DVD player, iPod dock, bar fridge, in room safe and quality bathroom amenities. An a la carte mini bar is available upon request. This room is 58m2 & sleeps up to 2 guests. Waterfront Villa – UPGRADE from only $700 per person! Holiday in style in a Waterfront Villa! The modern interior of the villa is packed with a range of luxuries such as a comfortable king size bed, air conditioning, in-house movies, Bose iPod sound dock, desk and more. You’ll find organic bathroom products to use in the spacious bathrooms that are equipped with walk-in shower, bathrobes and hair dryer. Your mini bar is stocked a la carte to your request too. Step outside and relax on the private deck. Cool off in the private plunge pool, get comfortable on the day bed or soak up the sunshine on the sun loungers, all while looking out at the panoramic views of stunning blue waters, neighbouring islands and volcano. Deluxe Waterfront Villa – UPGRADE from only $2000 per person! 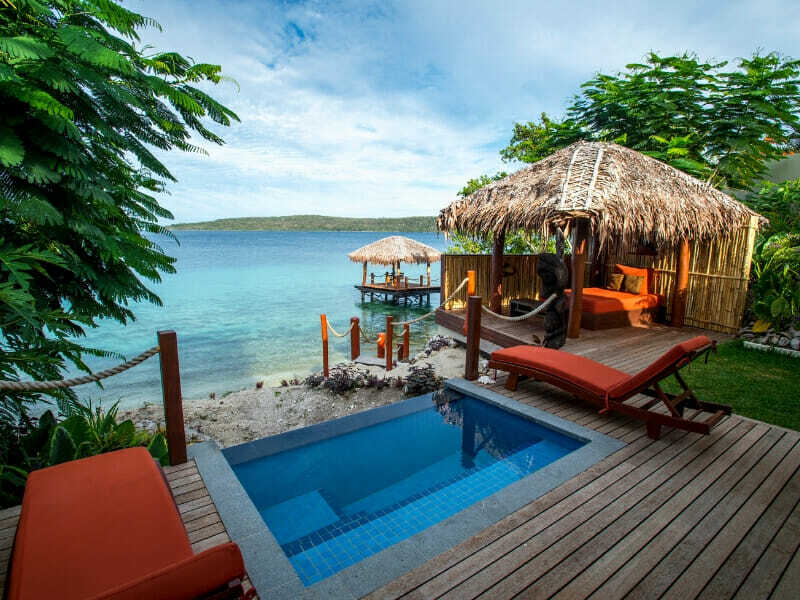 The Deluxe Waterfront Villas are the most luxurious accommodation at The Havannah Vanuatu. The villas make the most of the waterfront location with a sun deck featuring a private 7 metre infinity edge pool overlooking the azure waters, surrounding islands and volcano. Wash your worries away in the garden shower or soak I in the large outdoor bathtub. Each of the Deluxe Waterfront Villas are air conditioned and feature a king size bed with ensuite bathroom and walk-in shower and bath, a flat screen TV, Bose iPod sound dock, in room safe, bar fridge and quality bathroom amenities. Your mini bar is stocked a la carte to your request. The Havannah is a tropical destination unlike any other. This secluded and intimate resort is set on a jaw-dropping beachfront location and the staff here are focused on providing the highest quality of customer comfort with a friendly and personalised service. The Havannah is an adults only property. Read more about The Havannah here! **All meals included daily – All meals included daily – food only is included – drinks not included. Choose to dine in-restaurant, on the beach, on The Havannah Jetty, under the Flame tree or in the privacy of your own Villa.